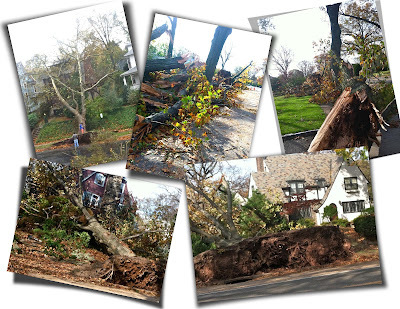 After Hurricane Sandy, my town still hosts lots of trees that just pulled out of the sidewalk -- or sometimes uprooted the sidewalks -- as they fell. The township has been great about removing branches from the road, but there are still trunks of trees and lots of branches piled up along the curb. The top left picture is directly across the street from my house; I took it from my studio window. One of the biggest problems, besides lack of power, is that everyone is running out of gas. There have been fist fights at some stations. It's crazy. I have two friends and their dog camping out at my house until their power is turned back on. I have friends stopping by for showers and to charge their phones. I am lucky to be able to offer these "luxuries!" With no gas to drive with, and so many places closed, it's been a prolific week for art! Speak kindly or don't: What is (negatively) thought but not spoken is better than what is thought and then said, which is better than what is said and then acted upon. 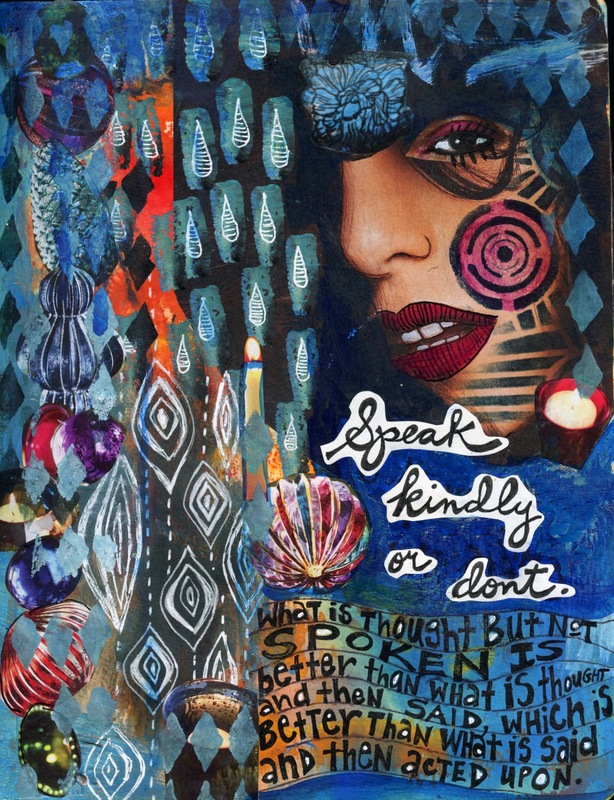 Here are two more "quick fixes" of art journal pages I had abandoned in disgust! This was a page I finished after our hurricane preparations. The photo at the center of this page is from an article about manipulating photography before photoshop. The words: "embrace imagination.. Think Different!" are advice I gave to myself as we stocked up on batteries, candles, and I made vats of soup. I love how this page ended up, even as much as I disliked what it started as! The only thing you can see from the original is the gorgeous Stencil Girl borders. I don't know what I'm going to write on this page -- I like it so much the way it is, it might take a while before something worthy comes to me! The CALENDAR PROJECT: It wasn't hard to find the time to finish my October calendar and start my November one. The first box in October says: This year, Halloween WILL HAPPEN in October. It can't possibly snow again. The last box says: NO Halloween this October again! Who would-a thought it! I originally intended the openings for the November days to look like leaves. 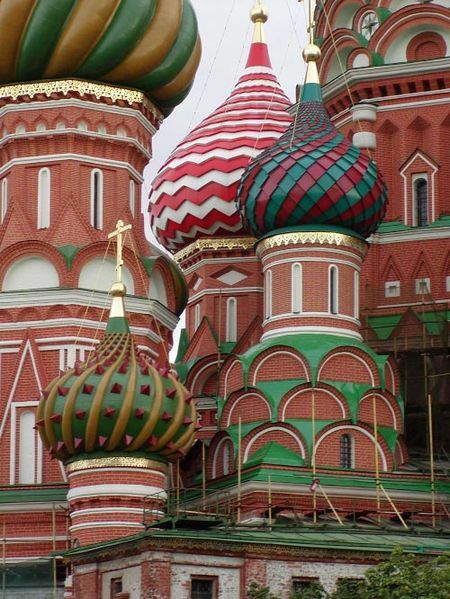 But I think they look like Byzantine onion domes! Working on the November calendar gave me a chance to practice the newest Zentangle, Bunzo. 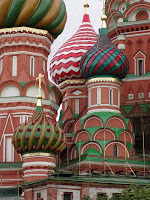 (Which also reminded me of Byzatine onion domes!) I haven't linked to the Diva in a while, and look forward to visiting some of the links there. Even though I joined in with the calendar project at the end of 2012, I really enjoy it, and am looking forward to continuing in 2013. Yesterday was the first day of Art Every Day month at Creative Everyday. 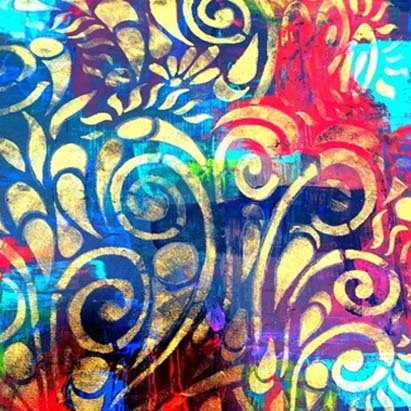 Hope you'll participate and check out all the fabulous links there, and at Paint Party Friday. 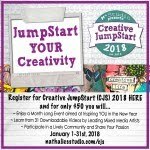 Remember that you still have a week to join in Artists in Blogland's 3rd Fall Fearless & Fly challenge! 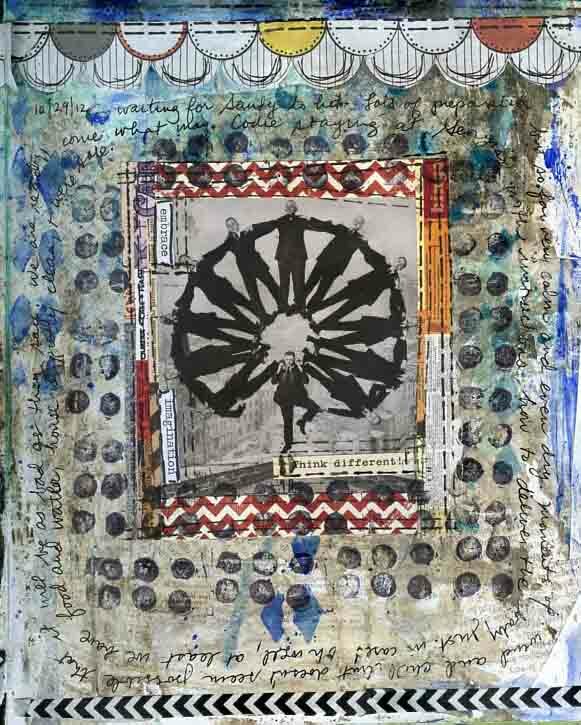 Check out Jane Davies' thoughtful work as our current guest artist. 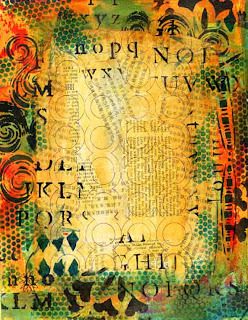 On Monday, November 12, there will be a new challenge with Maria McGuire as our guest artist. Can't wait to see what Maria does! Man, I hope things get back to normal for you guys soon. That is rough! What a wonderful assortment of work and those pictures are crazy, glad you're okay. 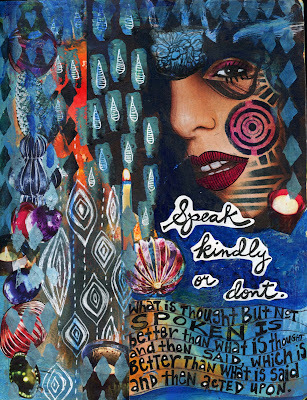 Love your pages - they are all very different and colorful - and very beautiful. Sounds like you are making the best of things with friends and art! Byzantine domes are one of my favorite architectural treats- so I definitely see that in your wonderful November calendar. You are such an inspiration making the most of this week...so glad you are safe. Great post! I am dumfounded that in the midst of it all, your creative muse was fast at work. I particularly like the first one because of the quote, but all of your reworks are beautiful. Perhaps you work better under "pressure". Let's hope November brings better days. Bless you for helping so many others who are in need! I'm new to your blog, and I'm really loving your work. I love the idea of your calendar pages and I'd like to try this myself. Thanks for all the inspiration! Oh My! You've had quite a week Jessica. I hope all is getting better recovering from Sandy. What a nightmare. Very COOL Journal and calendar pages. Great how the architecture inspire you. 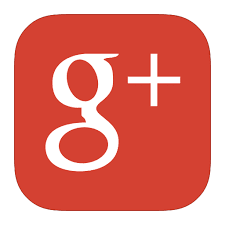 Going to check out some of your links. Be safe and happy PPF! Glad to hear you're recovering. And keeping your creative fires going. Jessica, so glad to know you are alright and that you have been blessed with the ability to help others in need. 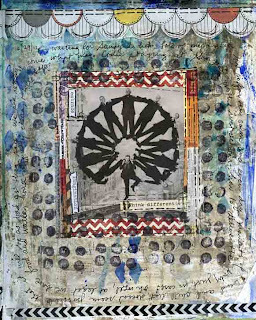 I'm amazed that you are creating art and blogging under the circumstances, good for you! Your pages are fabulous and I love your calendars! 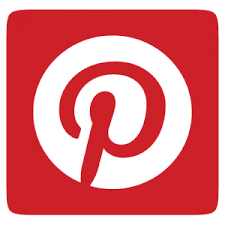 I will be checking out that link because you have inspired me! Keep safe, hope things improve quickly! Jessica, what a blessing you can offer that to friends, so glad to hear you are ok. Wonderful things will come your way and good Karma for you. I like your pages, my favorite is the first one. Hi Jessica, these are awesome journal pages and so spot on. I'm happy that things are okay for you and that you are helping those in need right now. It's people like you who do these things that make the world the right place to be. Thank you for being such a gracious and generous person. God will bless you. Take care. 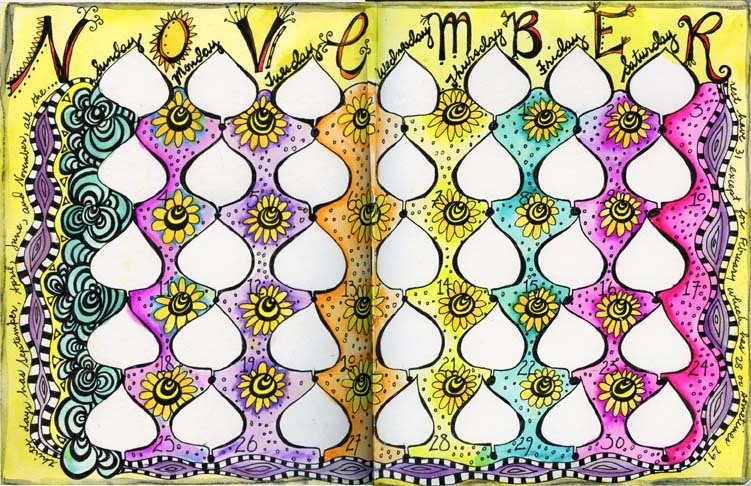 Fabulous calendar pages -- the colors for November are so vibrant and juicy! Thanks for the great reminder to hold my tongue. I need to bookmark this page. Jessica I didn't realize you were in the path of the storm - I'm so glad you are okay! You are an angel for helping those in need! It's awesome that you had extra time for creating - and your pages are beautiful! Oh my, good thing that that tree didn't fall on your house! Scary! I'm glad you're okay though. Amazing that you still found time and energy for creating such beautiful pages. 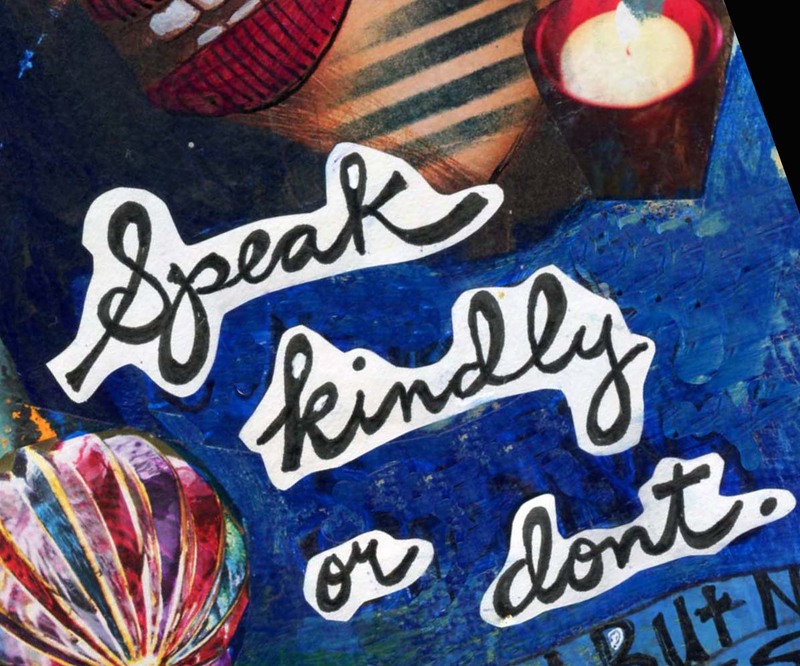 I especially LOVE the "Speak kindly or don't" one. It sounds like you have had a pretty mixed sort of time... stuck in the house, lots of work done and having friends stay )fun in a sort of a way.. if you forget the circumstance. 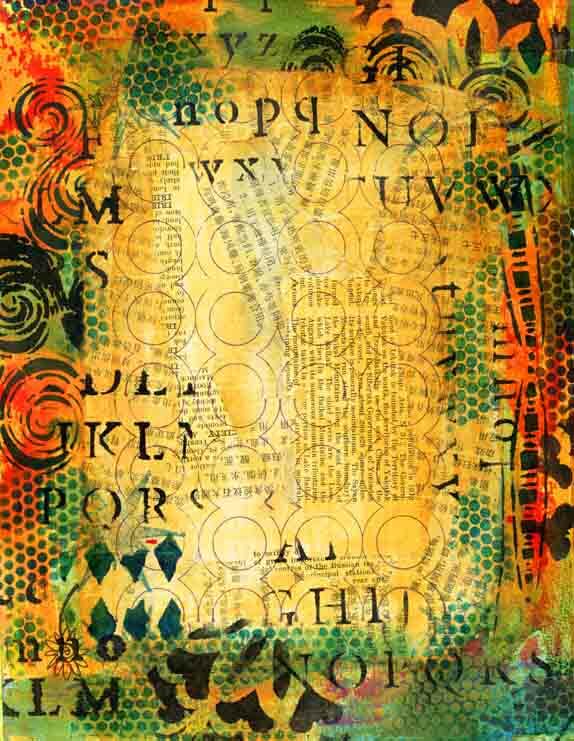 I love how your page ended up.. lots of layers and transparencies and it glows! Great work; the first one is appealing to me most. Glad you van help a lot of people there, glad you are a person that will do that. Gosh you have been busy....... I hadn't realised where you were. I'm so glad you are ok.
so happy you emerged with minimal damage! the uprooted sidewalks are just insane. I've never seen anything like it! Still waiting for our power to come back -- ugh! love that calendar project idea! We've got a few uprooted trees too - but at least most people here have power! Happy belated PPF! You sure put your hurricane time to good use! Love all the journal pages. Your friends must be so glad to have a warm haven of showers and power at your house! First, how wonderful of you to open your home for the victims that got hit hard. That will never be forgotten. Remember..karma. Your pages are lovely. I love the domes. I'm more of a curvy girl. Your October calendar ended beautifully. Who would have known that Halloween would be cancelled because of another storm in October. I'm afraid they say this may be the norm for the Northeast now? God, I hope not. wowza-so much fabulous eye candy here!! So glad to know the hurricane didn't do much damage for you. 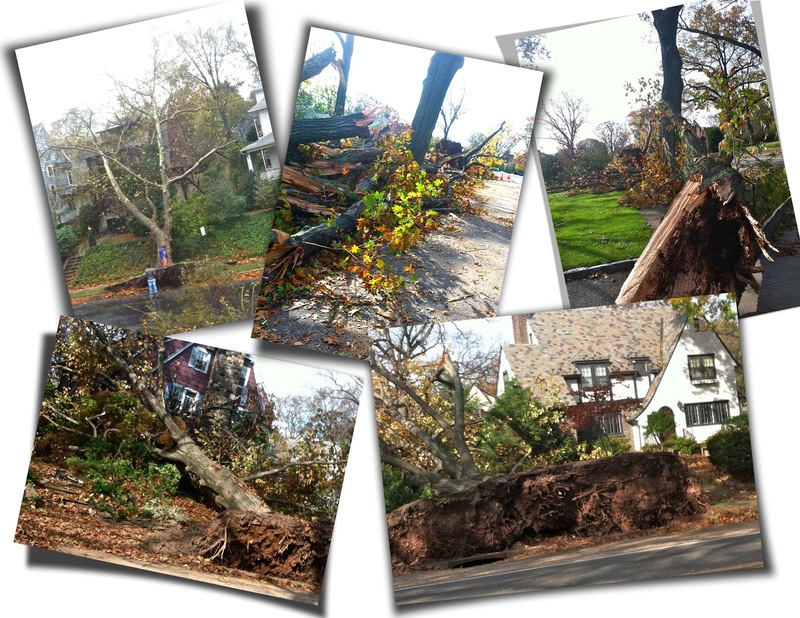 We were w/o power for 5 days and also had many trees and poles downed, along with two cell towers. Fortunately we don't seem to have a gas shortage at the moment tho I know lots of people are coming into PA for gas. Your posts and art are always filled with such wonderful detail.LOve your calendar spreads!! I'm so glad you're safe and sound. We opened our bathroom to friends too...way back in Hurricane Charlie. We were lucky to get our power back after only 10 days. All of your artwork is wonderful. The first one reminds me of Mom quoting Thumper..."If you can't say somethin nice...don't say nuthin at all". What a treat to pop over and see all the creativity you've been expressing this last week. 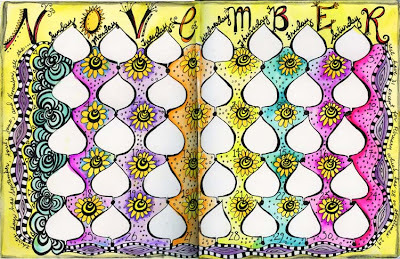 I love your page makeover and the Nov page made me think of planting bulbs for the springtime. Hope your neighborhood is getting back to normal. So glad you were spared the power failure! Oops! Skidding in late as usual ... but it is still November (just!). 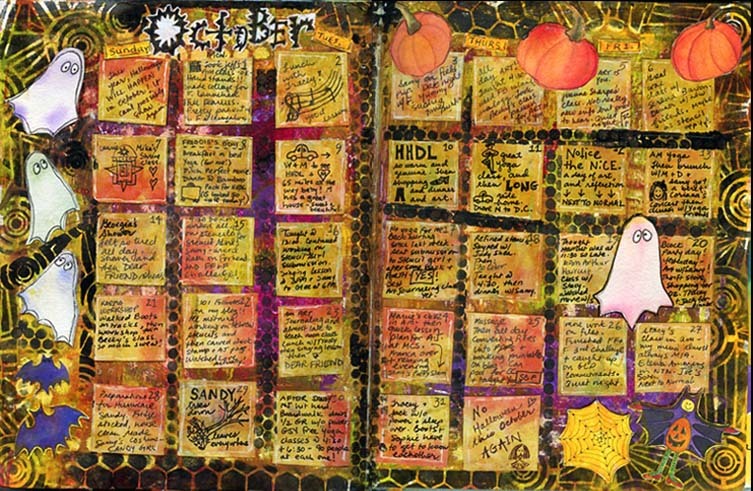 Love your calendar pages, and am in awe that you managed to complete them despite hurricane Sandy. Hope things are settling down for you over there and that things are getting back to normal.